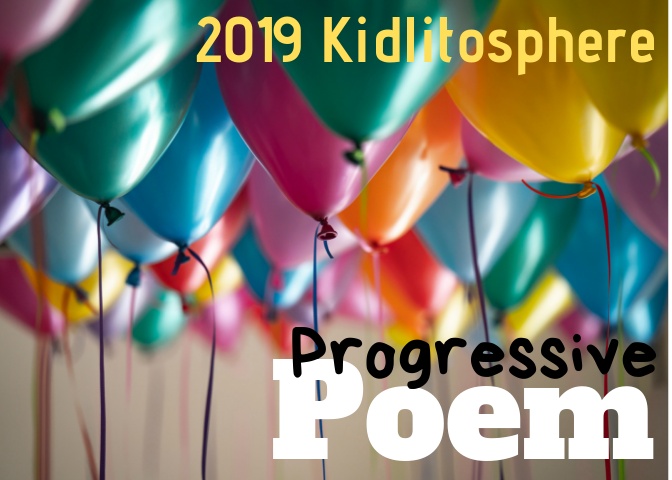 This is one of my favorite #haikuforhealing for the week, and I thought it would make a perfect visual for our Tumblr Roundup Host, Lisa at Steps and Staircases. Don't be afraid to submit your link. It's really easy! Click on "SUBMIT" at the top of the post and you'll get what looks like a comment form. 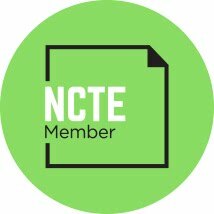 Give it a title, put in your name and email. Drop your link in the box. It's moderated, so Lisa will harvest out your link and add you to the roundup. You can't mess up! Go for it! The Roundup Schedule for January - June 2018 is nearly complete. Would you like to snag THE LAST slot? May 18 is still available!! I love this haiku Mary Lee, It's as full as can be, and then some! I think it would also make a great opening line in a story, thanks. I love the idea of offering the whole world to someone (or someones) in the form of these glorious seeds. I missed this one, Mary Lee, and it is gorgeous. I remember my first time seeing, then learning to eat pomegranates. Wow! 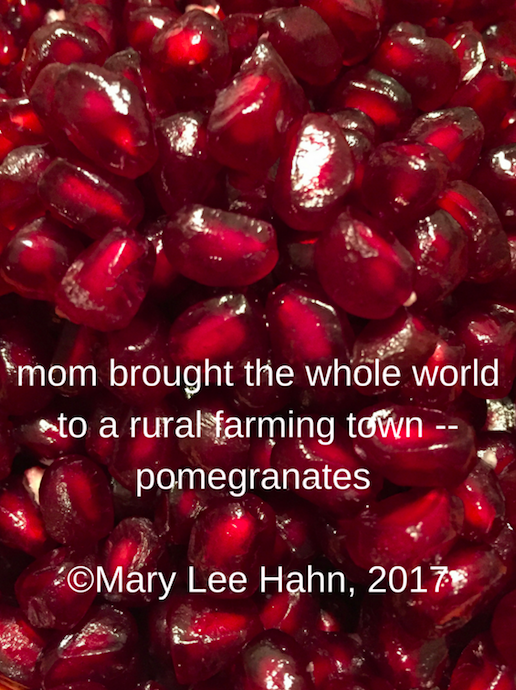 Mary Lee, pomegranates have been part of our family holiday traditions for generations. Their brilliant red consistency remind me of the loving hands that added them each year to a family meal. Thanks for sparking my memory with your haiku for healing. Pomegranates were never "invented" when I was a kid in Maine. So she truly would have been bringing us the world. There are so many unusual foods available to us now that weren't transportable not that long ago. Love the thought in the haiku and the brilliance of the fruit! This is gorgeous! I love the image of the ripe fruit along with the haiku--the world, indeed. Now I really want a pomegranate. Also, I am amused, because I always link pomegranates to mothers due to Persephone and Demeter! Pomegranates remind me of my mother. Back in the 1970s she'd tuck a wedge of pomegranate in our lunch boxes as a special treat. I like the flavor but never have enjoyed the seedy texture. Great haiku! Thank you for this juicy poemgranate. Did you mom bring them on or off the tree? Headed over to the Poetrepository now, with thanks for your visitations...Jabber-walking arrived! How fantastic! The jewel of fruits - and a gorgeous haiku, Mary Lee. 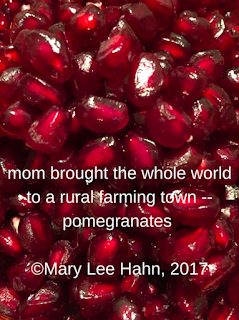 A pomegranate haiku...a small bite of beauty. Wow. I have none of these recollections of pomegranates. Now I'm wondering if I've even seen a pomegranate! I know I haven't tasted one. Juicy cross-cultural joy. Yay! for your rural Mom's outward looking gaze. Love this. I love pomegranates and the connection you make with them. A quick story: We had a pomegranate tree on our farm and when we were little, we were only allowed to eat the fruit if we were both naked and on an old sheet. Then we dove in and ate with gusto. Thanks for the instructions on how to post, too. I had a hard time figuring out this one. "mom brought the whole world"--what a starting line! Thank you for your assistance with Poetry Friday. I will attempt to capture some of the visuals shared to put into a mosaic on my blog. Thank you for the beautiful visual and poetic imagery.